The Scottish Rite builds upon the ethical teachings and philosophy of the Blue Lodge, through dramatic presentation of degrees. Membership is open to all Brothers and fellows who have attained the degree of Master Mason in a recognized Blue Lodge. Degrees conferred consist of the 4th through 32nd Degrees. 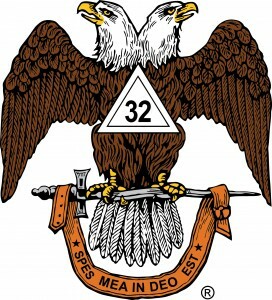 There is also an honorary 33rd degree, which is awarded for exceptional service. Isaac De Costa was an emissary commissioned to establish what was then called Morin’s Rite of the Royal Secret in the United States of America. He was instrumental in forming the constituent bodies of that Rite in South Carolina in 1783. Morin’s Rite became the Supreme Council of the Ancient and Accepted Scottish Rite, Southern Jurisdiction. All regular and accepted Scottish Rite bodies worldwide derive their heritage from this body. Many of the degrees of the Scottish Rite existed as parts of previous degree systems, which were distilled into the current system after the formation of the Mother Supreme Council at Charleston, South Carolina, in May 1801. Albert Pike is widely accepted within the Southern Jurisdiction as the man most responsible for the growth and success of the modern Scottish Rite. He received his 4th through the 32nd Degrees in March 1853 from Dr. Albert Mackey, in Charleston, S.C., and was appointed Deputy Inspector for Arkansas. In 1855 the Supreme Council created a ritual committee to update existing ritual. At this time, the rituals were frameworks with minimal detail. The committee included Dr. Mackey, John Honour, W.S. Rockwell and Albert Pike. Pike was elected to the Supreme Council in 1858, and became Grand Commander in 1859. During the Civil War, Pike was against secession, but joined the Confederacy. After the war, Pike continued his work on ritual revision, and completed the task in 1868. He also wrote extensively through 1871 on lectures for all the degrees, the culmination of which was the publication of the book Morals and Dogma of the Ancient and Accepted Scottish Rite of Freemasonry. Today, the Southern Jurisdiction is based in Washington, D.C. in the House of the Temple located at 1733 Sixteenth Street, NW in the District of Columbia. The Mother Supreme Council of the World oversees the Scottish Rite Orients in 35 states, and these Orients in turn oversee their local Valleys. The Scottish Rite is a very active philanthropy, operating the RiteCare Childhood Language Center, various youth programs and offering scholarship programs through our Supreme Council.